Accupressure is a safe and effective way to prevent and ease the nausea associated with morning sickness. How are BioBands different from other acupressure bands? 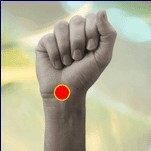 Applying the correct amount of pressure to a particular point is the key to acupressure. BioBands adjustability allows users to customize the pressure for maximum effect. Unlike elastic type travel bands, which can be too loose or too tight, BioBands adjustable watchband construction gives the user ultimate comfort and superior effectiveness. Its built in pressure point will not irritate wrists like other exposed bead versions. All other travel bands require wearing two bands per use. With BioBands precise adjustability users need to wear only one band for optimum results. The BioBand can be worn over and over. Even salt water will not affect its wear. Especially important when worn for water sports! Purchase BioBands Adjustable Accupressure Bands from our retail website, BabyHopes.com. 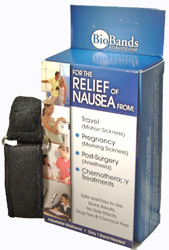 Developed by Robert C. Giarratano, M.D., an American Board Certified obstetrician and gynecologist, BioBands bracelets are the only safe, simple, effective and inexpensive way of relieving nausea related conditions. The bracelet utilizes acupressure, a natural pressure therapy applied to a specific acupuncture point that controls nausea and vomiting. A small bead embedded in the adjustable bracelet presses down on the P6 (Neiguan) point, located three finger widths above the wrist crease between the tendons of the flexor surface of the forearm, approximately in the area of a watchband.